For all your outdoor activities, bring along the gazelle gazebo. 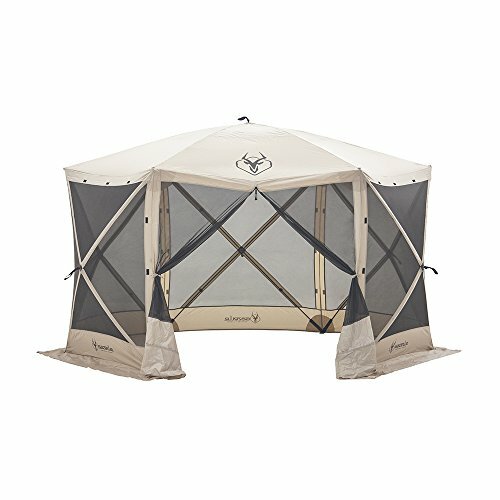 This portable, 6-sided screen tent is perfect for picnics, family gatherings, or spending leisure time relaxing outside. The roof of the gazelle gazebo is made from a UV resistant, waterproof polyester material, so a rain is no issue! each wall of the gazebo is made with tightly woven mesh, so even the smallest insects can't get through. The umbrella frame is the fastest, most easy-to-use system for creating a portable and solid tent frame. Each umbrella frame panel is equipped with durable fiberglass poles that come together at a central hub. All of the hubs and poles are permanently connected to the tent fabric, so the umbrella frame requires no assembly and has no loose parts. The entire gazelle gazebo can be set up and taken down by one person. Simply pop out each panel in succession and it is ready to use! new this year, optional gazelle wind panels are available, to protect you from blowing winds and rain.